Newton's Cradle is a clever device that uses a series of equal pendulums in a row to demonstrate the Laws of Conservation of Momentum and Conservation of Energy. By pulling one ball away from the others and releasing it, the ball will swing and strike the second ball, which in turns sends the momentum through the series of balls causing the last ball to move away from the group. When the last ball swings back, its collision then causes the first ball to move away. This process repeats until it finally wears down. Pulling away several balls will result in the same number of balls moving away at the other end. This device is often used for demonstrations in the classroom, as well as a toy to amuse people. Newton's Cradle was invented in 1967 by English actor Simon Prebble and named in honor of scientist and mathematician Isaac Newton, because it employs Newton's Laws. What is a description of Newton's Cradle? What requirements are there on constructing Newton's Cradle? What does Newton's Cradle look like in action? Newton's Cradle consists of several metal balls (usually 5) suspended from a rack by wires, such that they line up and are almost in contact when in a resting position. There are two wires attached to each ball to keep the pendulum motion in one plane. 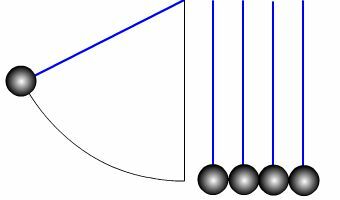 When an end ball (ball a) is pulled up and let go, it swings down as a pendulum and hits the next ball. The energy and momentum from that ball is transmitted through the three balls at rest to the fifth ball on the other end (ball e). That ball is propelled forward at the same velocity as the first ball had, due to the force of the first collision. This process continues as ball e reaches its peak and then swings down to hit the balls at rest, propelling ball a forward and upward. If two or more balls are pulled up and let go at the same time, the collision will result in the same number of balls will be propelled forward on the other end. The pendulum action will go back and forth until it gradually slows down due to losses from friction and the elasticity of the balls. Steel balls are usually used, because they deform very little upon collision and are highly elastic—meaning only a small amount of energy is lost in the collision. The balls in Newton's Cradle should be the same mass. Even a slight deviation will change the derivation equations and result in slightly different results. It doesn't matter how many balls are used, although the more you use, the greater the chances for deviations. The balls should be perfectly aligned. If some balls were not on a straight line, the transfer of momentum and energy would also be misaligned, changing the outcome. Spherical balls are used because their contact is approximately a point. Other shaped objects could be used, but that increases the chances for misalignment. Hard metal balls—such as made of hardened steel—are used to minimize losses in energy due to elastic distortions. Balls are hung with a pair of strings or wires in order to keep them in alignment and to minimize losses due to friction. The following simulation allows you to explore Newton's Cradle on your computer, similar to using the real device. Note that you must have the Flash player installed in your computer to use this simulation. Place you mouse pointer on an end ball, hold down the left mouse button, and drag the ball, so it is at an angle. Then release the mouse button and let the ball swing free. You will see that only one ball on the other end of the group swings up at about the same speed as the ball you let go. Notice that the balls start to slow down and will bounce less and less until they finally stop. This is due to losses from friction and energy that is absorbed in the balls. The effect is called damping of the periodic motion. You can drag two, three or four balls and let them go. The same number of balls you release will be moved forward upon the collision with the moving balls. This verifies the Law of the Conservation of Momentum, which states that the momentum (mass times velocity) remains the same after a collision. Newton's Cradle demonstrates laws of motion, including the Laws of Conservation of Momentum and Energy. The simulation allows you to experiment swinging different number of balls to verify the conservation of momentum.